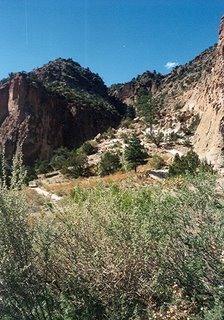 V and I had an adventure in New Mexico that Spring (my first real travel adventure, really). We stayed with friends in Albuquerque and set out each morning to explore. Was this the day we went to Jemez, too? I think so. 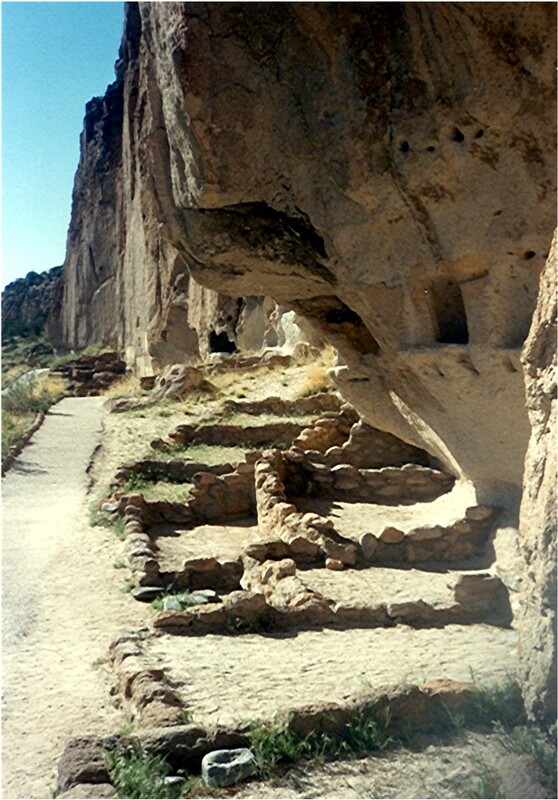 We were just remembering our visit to Jemez: how the place was almost too powerful; how V painted but made me stay away so I couldn’t see her picture (shy thing, back then); how we would love to return some time. 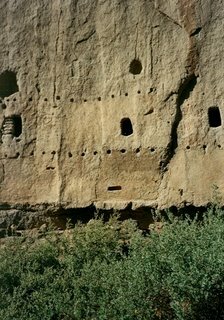 Anyway, we got to Bandelier somehow, having stopped every once in a while to marvel or cry or both. I was overwhelmed at every turn in the road, having lived most of my life in the green, rolling terrain of Maryland and Virginia. To see the whole dome of the sky, and the curve of the earth — Oh my. It wasn’t until I moved here to Long Island and saw the horizon again, and the whole sky over the ocean, that I felt anything similar. 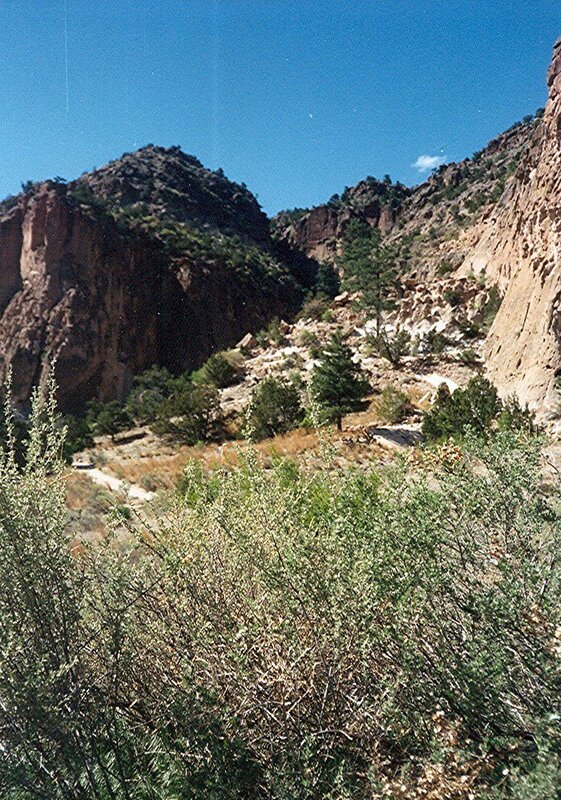 This place, this Bandelier, held us for the rest of the day. I am trying to describe this one afternoon, but I am still at a loss for words. I can’t do it. All I can say is that I was changed forever on that trail beside the Anasazi cliff dwellings, and if you have been there, you might know what I mean. B also stands for Brave, which is what I found out I was capable of being. That week in New Mexico, though I didn’t know it then, was the beginning of the journey that brought me here, to Long Island, to the life I live now, and to this very moment. B could have been for books, too, since books are my daily life, my bread and butter — but that would have been too easy! So anyway…it seems that the life I live right now is about nothing but preparing for the Knitting Olympics. The initial thrill has worn off. Now it’s down to the serious preparations, the real training. I’m chugging away on the New and Improved More Acceptable Jaywalkers, but they’re not ready for their closeup yet. These socks will need a good wash and set before meeting their public. This week I’ll begin swatching the yarn for my Olympic sweater, and then I’ll be able to work out the pattern and the measurements. I’m thinking simple V-neck, modified drop sleeves (or maybe raglan, who knows? ), tunic style, with short side slits and garter edging. 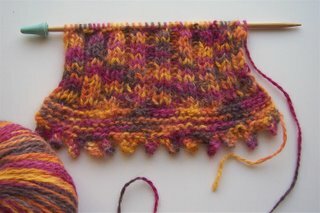 I’m hoping that it will become a little frou-frou thing with a slightly wavy edge when it’s looped around a neck. It began as a lace scarf from the Accessories Collection book, but following any pattern with more than a two-row repeat hurts my brain right now. And don’t you love my innovative needles? Where are all my size 7’s, anyway? I have a Denise set for these kinds of emergencies, but this yarn sticks to plastic, so I improvised with bamboo dpn’s. Enough, now. The blue sky is calling me, and there’s knitting to be done! 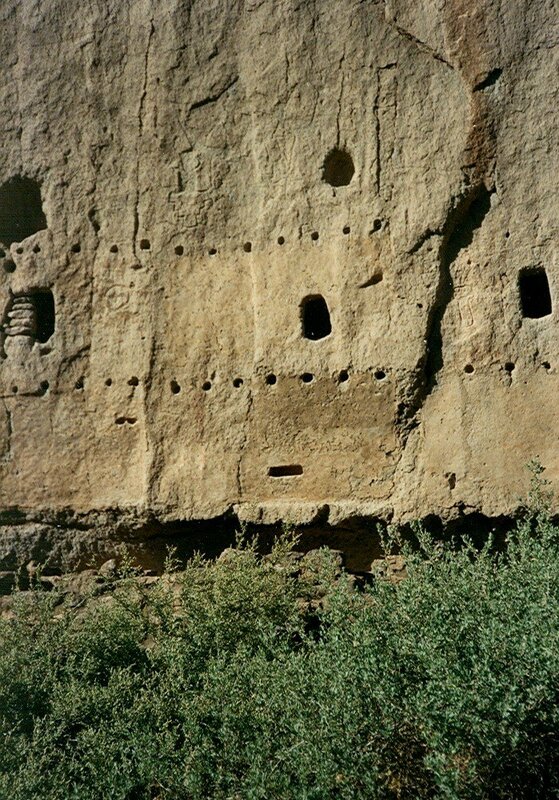 Bandelier… ah. Thanks for evoking memories. Amie is right.sigh.And I suppose you didn’t realize that size 7 needles are serious party animals and dissappear from any responsible place as soon as your back is turned. You’ll find them, drunk and passed out on the couch in some frat house. Those Addi turbos beside them are mine. Please wake them up and send them home. Wonderful B! And an amazing adventure; thanks for sharing! Thanks for the “B”! It made me homesick but in a good way — I have so many good memories from living in NM. Some how I missed your “B”. What a beautiful place to spend some time. I love the desert and the ruins found there.